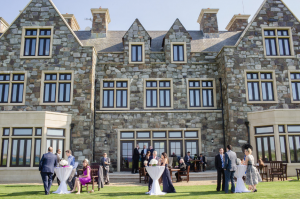 Today’s real wedding blog showcases our beautiful couple Jessica and Damien, who celebrated their fantastic destination wedding at Trump International Hotel, Doonbeg, surrounded by their closest friends and family. 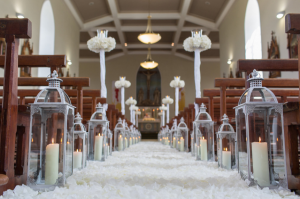 The Cavan-native Damien and his stunning bride Jessica from Toronto decided on a charming church ceremony, exquisitely decorated in 100’s of white florals, petals, candles and metres of white carpet & draping. 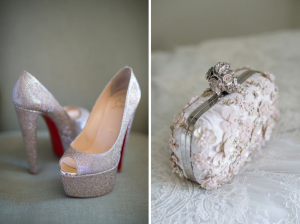 Jessica wore a Couture gown by Inbal Dror, silver Louboutin shoes and magnificent jewellery – a wedding gift from her mother, starting a family heirloom. 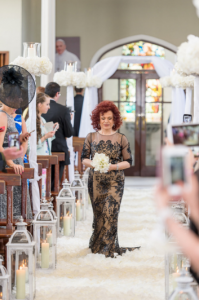 While choosing to not have any bridesmaids, Jessica had a very special Maid of Honour her mum wearing a magnificent dress by Oscar de la Renta, while her Dad had the equally special task of walking his daughter down the aisle. 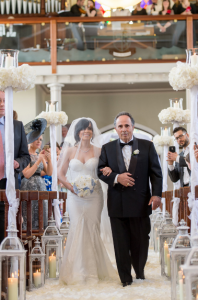 In keeping with the all-white colour palette (other than a hint of blue) the bride and her father arrived at the church in an all-white Bentley while the groom Damien and guests arrived in vintage busses. 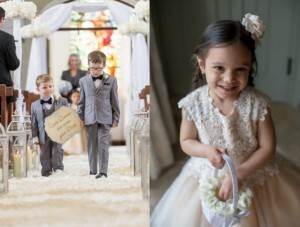 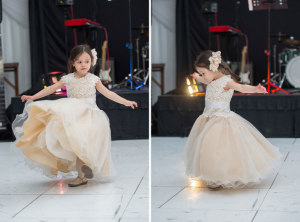 Included in their beautiful ceremony, were their niece and nephews, who did a great job as flower girl and page boys. 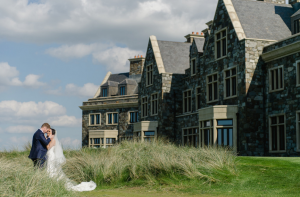 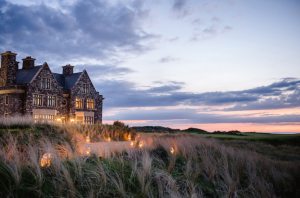 After the ceremony, the wedding party travelled to Trump International Hotel, Doonbeg for the wedding reception. 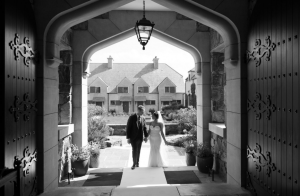 The sun came out to welcome all the guests to the Lodge for the cocktail reception ensuring the photographers captured some amazing moment. 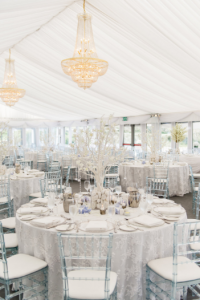 The all-white colour scheme, the couple decided on for the day, was also included in the decoration for the reception in the Doonbeg Pavilion. 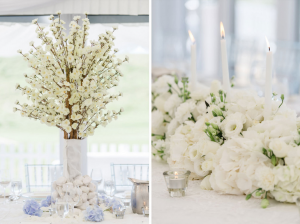 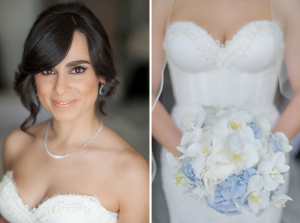 While the hint of blue, which was introduced to the table with florets of gorgeous blue hydrangea, was also to be found in Jessica’s bouquet. 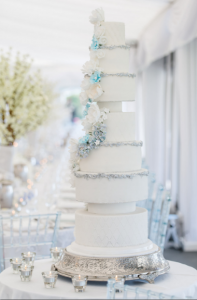 MM Cookies once again created a masterpiece in the form of a seven tier wedding cake with sugar paste flowers, similar to Jessica’s bridal bouquet and their wedding stationery, including the ceremony programs. 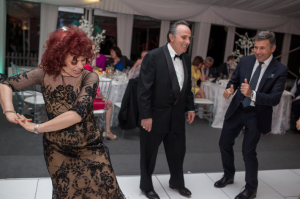 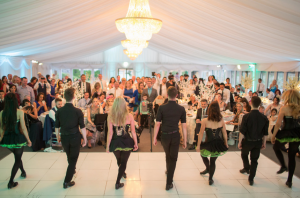 During dinner, the very talented Mystic Force performed a high octane set of dance & music, adding that world famous Irish culture to the wedding day. 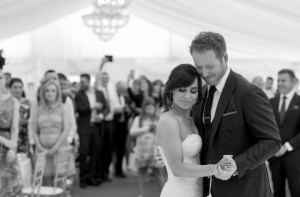 Completing the night, the 10 piece band Bentley Boys entertained young and old into the early hours and made newlyweds first dance an unforgettable experience. 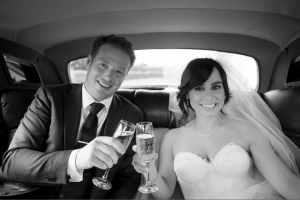 After their honeymoon in Europe, Damien and his wife Jessica returned home to Toronto, where the two met and are now living their happily ever after. 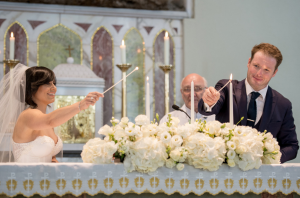 Wishing them a lifetime of love and happiness.